Dying, you destroyed our death; rising you restored our life. Save us by your cross, Christ our Redeemer. On the Feast of the Exaltation of the Cross (or Triumph of the Cross) we honor the Holy Cross by which Christ redeemed the world. The public veneration of the Cross of Christ originated in the fourth century, according to early accounts, beginning with the miraculous discovery of the cross on September 14, 326, by Saint Helen, mother of Constantine, while she was on a pilgrimage to Jerusalem -- the same day that two churches built at the site of Calvary by Constantine were dedicated. The observance of the Feast of the Exaltation (probably from a Greek word meaning "bringing to light") of the Cross has been celebrated by Christians on September 14 ever since. In the Western Church, the feast came into prominence in the seventh century, apparently inspired by the recovery of a portion of the Cross, said to have been taken from Jerusalem the Persians, by the Roman emperor Heraclius in 629. Christians "exalt" the Cross of Christ as the instrument of our salvation. Adoration of the Cross is, thus, adoration of Jesus Christ, the God Man, who suffered and died on this Roman instrument of torture for our redemption from sin and death. The cross represents the One Sacrifice by which Jesus, obedient even unto death, accomplished our salvation. The cross is a symbolic summary of the Passion, Crucifixion and Resurrection of Christ -- all in one image. The Cross -- because of what it represents -- is the most potent and universal symbol of the Christian faith. It has inspired both liturgical and private devotions: for example, the Sign of the Cross, which is an invocation of the Holy Trinity; the "little" Sign of the Cross on head, lips and heart at the reading of the Gospel; praying the Stations (or Way) of the Cross; and the Veneration of the Cross by the faithful on Good Friday by kissing the feet of the image of Our Savior crucified. We remember Our Lord's words, "He who does not take up his cross and follow me is not worthy of me. He who finds his life will lose it, and he who loses his life for my sake shall find it." (Mt 10:38,39). Meditating on these words we unite ourselves -- our souls and bodies -- with His obedience and His sacrifice; and we rejoice in this inestimable gift through which we have the hope of salvation and the glory. In obedience to you your only Son accepted death on the Cross for the salvation of mankind. We acknowledge the mystery of the Cross on earth. May we receive the gift of redemption in heaven. sure hope and perfect charity. The feast of the Exaltation of the Cross is in honor of the Cross of our Lord Jesus Christ. Observed on September 14, it is also known as 'Holy Cross Day'. The liturgy of this feast in the Syrian Orthodox Church recalls the tradition which narrates the story of Helen, mother of Emperor Constantine, who went to Jerusalem to look for the Cross. This day is also called the Exaltation of the Cross, Elevation of the Cross, Holy Cross Day, Holy Rood Day, or Roodmas. This feast was observed in Rome before the end of the seventh century. It commemorates the recovery of the Holy Cross, which had been placed on Mt. Calvary by St. Helena and preserved in Jerusalem, but then had fallen into the hands of Chosroas, King of the Persians. The precious relic was recovered and returned to Jerusalem by Emperor Heralius in 629. How blessed are those who are saved by the cross of our Lord Jesus, for they have obtained a godly power to overcome Satan and sin. For them natural death has become a transition from a miserable, transitory life to a glorious, eternal life. How miserable are those who are perishing for they do not know the holy sacraments, they have lost their power, and the sacraments have become nonexistent to them. On this day are commemorated two events connected with the Precious Cross of Christ: the first, the finding of the Cross on Golgotha and the second the returning of the Cross to Jerusalem from Persia. In the mirror of the Cross we have seen all the sufferings of today's humanity. But we have also seen stations of consolation. We have seen the Mother which goodness remains faithful on till death and beyond death. we have seen the bold women before her Lord without fear of proving her solidarity with the suffering. We exalt the Cross because it is the symbol of victory. And in the opening of today’s Gospel reading Jesus tells us what this victory is: the ruling power of this world is put to flight. Christ on the Cross will reunite the human community. Paul admonishes Philippians to follow him and to mark those ministers who walk as he does; also to shape their belief and conduct by the pattern they have received from him. Not only of himself does he make an example, but introduces them who similarly walk, several of whom he mentions in this letter to the Philippians. O Crux, ave spes unica! Hail, O Cross, our only hope! The Elevation of the Cross, celebrated on the fourteenth of September, commemorates the finding of Christ's Cross by Saint Helen, the mother of the Emperor Constantine in the fourth century; and, after it was taken by the Persians, of its recovery by the Emperor Heraclius in the seventh century at which time it was "elevated" in the Church of the Resurrection in Jerusalem. We are celebrating the feast of the cross which drove away darkness and brought in the light. As we keep this feast, we are lifted up with the crucified Christ, leaving behind us earth and sin so that we may gain the things above. Early in the fourth century St. Helena, mother of the Roman Emperor Constantine, went to Jerusalem in search of the holy places of Christ's life. She razed the Temple of Aphrodite, which tradition held was built over the Savior's tomb, and her son built the Basilica of the Holy Sepulcher over the tomb. During the excavation, workers found three crosses. Legend has it that the one on which Jesus died was identified when its touch healed a dying woman. In the Gospel of this feast we are witnesses of an unusual conversation between Jesus and Nicodemus. The conversation takes place at night because Nicodemus, a prominent Jew, went to talk with Christ under the cover of darkness. Today the Church makes special reference to these words of Christ as she celebrates the feast of the Triumph of the Cross. Beyond the particular historical circumstances that contributed to the introduction of this feast in the liturgical calendar, there remain these words that Christ spoke to Nicodemus during that conversation which took place at night: "The Son of Man must be lifted up". The sign of the Cross is a kind of synthesis of our faith, for it tells how much God loves us; it tells us that there is a love in this world that is stronger than death, stronger than our weaknesses and sins. The Cross is the central fact of the Faith, it is not only where Christ was crucified, as we have heard in today's Gospel, but it is also where Christ is risen from the dead. It is also written elsewhere in the Gospels that by losing our life through the Cross, we save our life. The way of the Cross is also taking on the yoke of our Lord Jesus Christ. But He said, it's easy and light. The way of the Cross is not easy and light. This is where the mystery comes in. This is where the Christian begins to understand, in living his life, what the Lord means by 'the way of the Cross' and by His promises that in the world we will have tribulation and then also promising that His yoke is easy and his burden is light. For the ancient peoples the cross was the ultimate sign of terror and dread and in this very sign that the world sees as the greatest humiliation and degradation we see the sign of victory that has saved us! We come today to venerate and praise that instrument of our salvation, the cross of Christ. All of us, without exception, share in the sufferings of Jesus Christ. We all know what it means to carry the cross of Christ: the cross of physical or emotional suffering (either our own or that of someone we love); the cross of grieving the death of someone dear to us; the cross of being betrayed or rejected by someone we love, etc. This is our joy today because by the Cross we are spiritually renewed! Yes, spiritually renewed! Isn't it ironic and foolish sounding that we are renewed by the Cross – something so painful. Yet, truly we are renewed by the Cross for it is saving power to us. The suffering of the cross, its hard necessity in life, its reality as a way of following Christ is not presented to the faithful on Sunday, the feast of the Exaltation of the Cross. Instead the glory of the cross, the cross as a reason for boasting and not for weeping is given pride of place. Today the sign of the cross has become a universal Christian symbol. When people sneeze and cross themselves or athletes make a sign of the cross before or during play, we recognize them immediately as Christians. Ornamental crosses are fashionable today in the form of necklaces, broaches, earrings, and the like. We celebrate this important feast for two reasons: (1) to recall an historic event that proved to be extremely important in the life of the Christian church, and (2) to underline the importance of the symbol and reality of the cross in the daily life of every Christian man or woman. 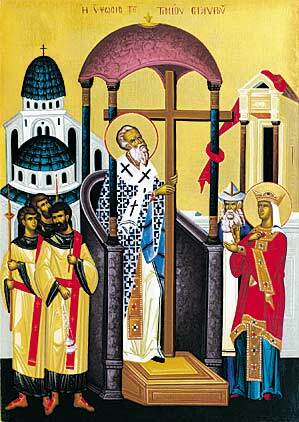 Today we celebrate the Feast of the Exaltation of the Holy Cross. Once again we see in the scriptures how God unfolds his plan of salvation over thousands of years. The Gospel clearly shows us that when Moses raised the Serpent (the seraph) on a pole to save the people from their sins how this foretold that Christ would be lifted high on the cross to save us from our sins. The two timbers on which the Messiah died to save the world, priceless beyond measure, form the most familiar and beloved symbol in a world full of symbols and emblems. For nearly three hundred years after his death the Cross was buried in obscurity, eventually to be salvaged through the efforts of a devout Byzantine emperor and his mother. Before the time of Christ, the cross was an instrument of punishment; it evoked fear and aversion. But after Christ's death on the Cross it became the instrument of our salvation. Through the Cross, Christ destroyed the devil; from the Cross He descended into Hades and, having liberated those languishing there, led them into the Kingdom of Heaven. September 14, is the day when Christian churches celebrate the Feast of the finding of the cross on which Christ was nailed and on which he died. The story of the unearthing of the Holy Cross is well established in historical records and ecclesiastical writings. I shall, First, endeavor to show, what it is for a man to "deny himself, and take up his cross daily." This is a point which is, of all others, most necessary to be considered and thoroughly understood, even on this account, that it is, of all others, most opposed by numerous and powerful enemies. Sermon based on 1 Corinthians 1:18-25. As we look into our text in 1 Corinthians, a question that it brings out is whether or not it is a worthwhile endeavor for us to search for knowledge of God through the wisdom, philosophies, and religions of the world. Will such a search help you narrow down your options? How would you know when to stop?